The only thing better than strawberry shortcake? It really doesn’t get any better. Homemade brioche doughnuts, grilled and topped with sweet strawberries and whipped ricotta cream. COME ON… how could this not be the most ultimate summertime dessert?!? YOU NEED these in your life… preferably today. I am kind of freaking out over here, just so much love for these shortcake doughnuts, SO MUCH love. ??? Okok, so here’s the deal. Ever since about three months ago, I knew I wanted to make strawberry shortcakes. I had the thought in my head and it just sounded SO good that I wrote it into my content calendar right then and there. I didn’t have the exact recipe down, but I knew I wanted to make some kind of strawberry shortcake. When it finally came time to actually make the shortcakes I did a little brainstorming and somehow, someway, doughnuts became involved. I have to say, it was one of my better ideas, because YOU GUYS, these doughnuts are everything…. or shortcakes or whatever you want to call them. Let me just be totally upfront with you guys, prior to these doughnuts, I had never made, nor even had, anything strawberry shortcake. I know, I know what?!?! It’s such a classic!! Well, I grew up with a chocolate loving mom and summertime desserts consisted of chocolate ice cream, blizzards, ice cream cakes, cookies, chocolate cake, K-Bars and well, more chocolate ice cream!! We are not a fruit dessert family…or we didn’t used to be, but I’m kind of changing things up… or well sort of. Technically, whenever I make a fruit dessert, we (mom and I) eat it for lunch… or more like brunch. Yes, these doughnuts were totally eaten for lunch, and yes, they were totally awesome. ANYWAY, no matter when you eat these, whether it’s breakfast, lunch or dessert, these doughnuts are going to be your go-to summer delight! The super dangerous thing about this recipe? 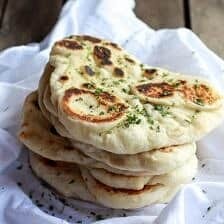 They can be made and ready for eating in just about thirty minutes. I used my favorite homemade brioche doughnut recipe for the doughnuts. 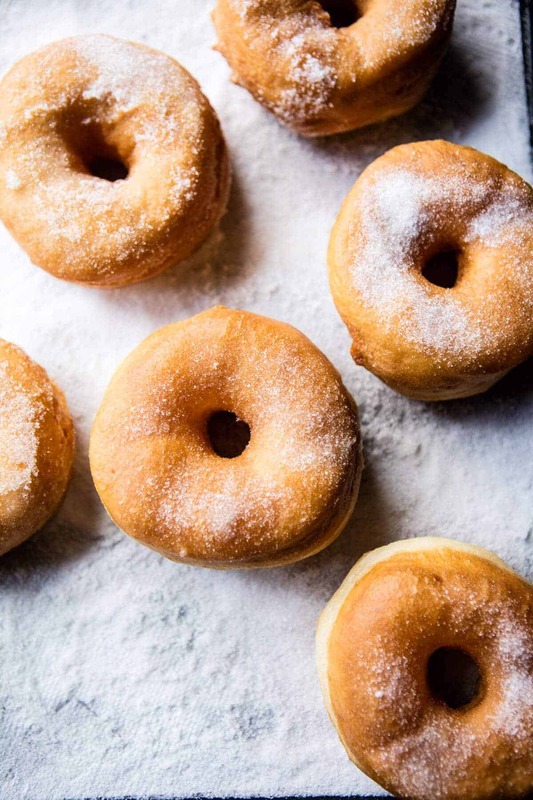 You can also use store-bought doughnuts, either way will still be heavenly. It just depends on the amount of time you have. 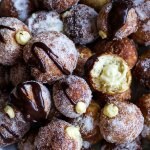 If you DO have the time, my brioche doughnut recipe is really simple and easy to make. You really need to give it a try. If you are not into frying, then store-bought all the way! Once you have your doughnuts, the rest goes QUICK. You want to toss your strawberries with a little sugar and let them sit for a bit so they can begin to release their yummy juices and create the most delicious sauce. 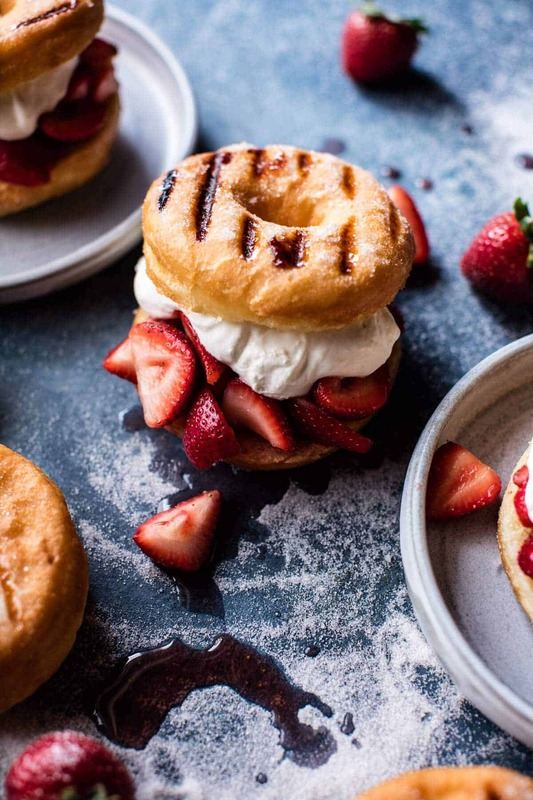 Whip some ricotta with a little vanilla, heat your grill (you can also use a grill pan or skillet), grill you doughnuts…then assemble…and DEVOUR! Grilling the doughnuts is not a complete must, but then it kind of is. Grilling the doughnuts caramelizes the outsides of the doughnuts while warming the insides. Just think super sweet, slightly crisp on the outside, and so soft in the middle. It makes for the PERFECT base to your shortcake. Trust me. Simple as can be, but possibly one of the bestest sweets I have eaten in a long time. Yes, these are that good. OH, and as if you needed another reason to jump up and make these doughnuts, today oddly happens to be National Doughnut Day. Scary as this is, I truly did not plan this post to fall on today, but obviously it’s just yet another sign that these doughnuts need to made and eaten today. No excuses. Let’s do this! It really doesn't get any better. Homemade brioche doughnuts, grilled and topped with sweet strawberries and whipped ricotta cream. COME ON... how could this not be the most ultimate summertime dessert?!? In a bowl, combine the strawberries, sugar, lemon zest and vanilla, tossing well to combine. Let the berries sit at room temperature for at least 20-30 minutes until the berries have released their juices. After 30 minutes at room temperature the berries can be kept in the fridge for up to 1 day. Meanwhile prepare the cream. In the bowl of a stand mixer (or use a hand held mixer) fitted with the whisk attachment, whip the cream cheese until light and fluffy. Add the ricotta and heavy cream, continue to whip until the the ricotta is smooth and the cream has fluffed, about 6-8 minutes. Add the vanilla and whip until combined. Keep the cream covered in the fridge until ready to assemble your shortcakes. 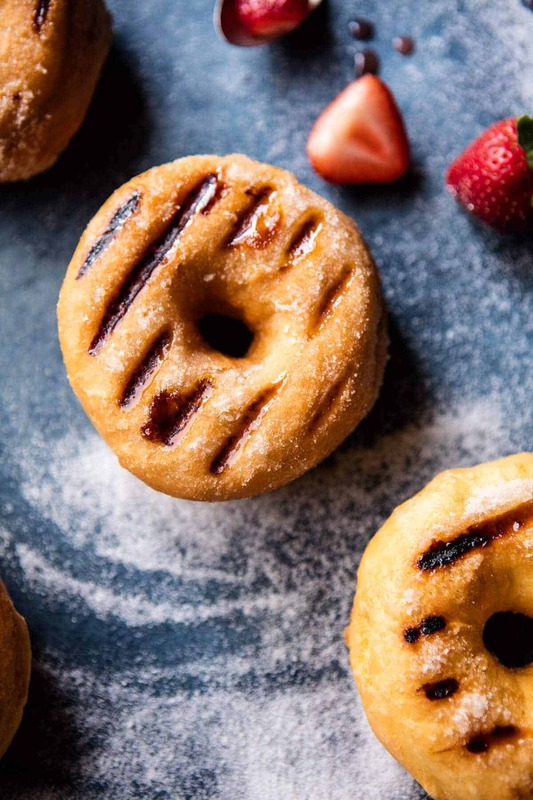 Grill doughnuts until lightly caramelized, 30 seconds to 1 minute per side. Watch closely, they can burn easily because of the sugar. Allow the doughnuts to cool slightly and then slice in half. 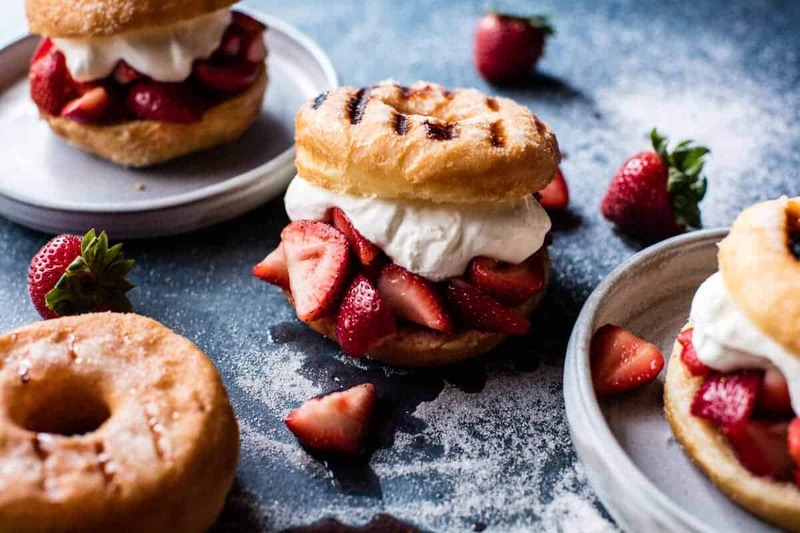 Fill each doughnut with strawberries and a dollop of cream. EAT... no, DEVOUR! In a large mixing bowl (I like to use my stand mixer), combine the warm milk with the yeast and sugar. Allow the mixture to sit 5-10 mins or until the mix is foamy and smells like bread. To the bowl, add the butter and egg, mix a little to combine and then add 3 cups flour and the salt. Knead the dough using a dough hook or your hands until the dough comes together and is smooth, about 3 minutes with a mixer and 5-10 by hand. If the dough seems too sticky, add the remaining 1/2 cup flour. The dough should come together, but be slightly sticky to touch. 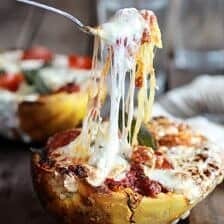 Grease a large bowl and place the dough ball inside. Cover the bowl and let rise in a warm place until doubled in size, at least 30 minutes. To fry the doughnuts, line 2 baking sheets with parchment. Lightly flour a work surface and roll out the dough to a 1/2-inch thickness. 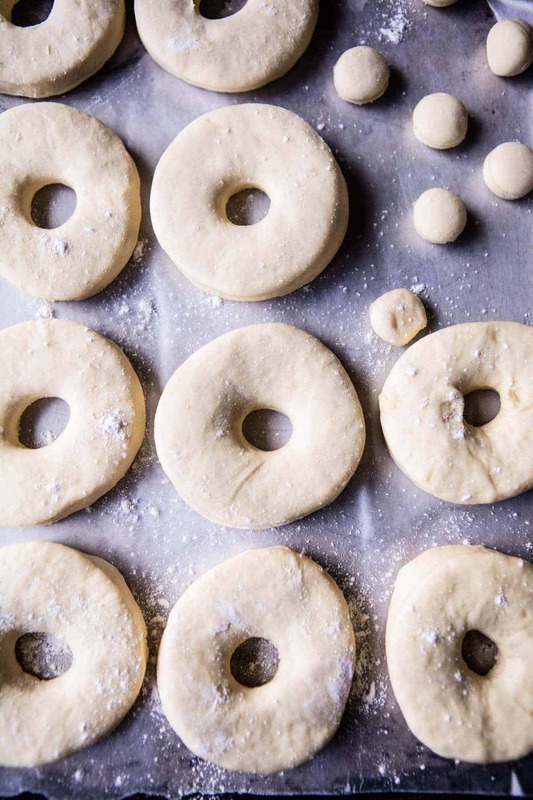 Using doughnut or cookie cutters, cut out round of dough. Arrange the doughnuts on the prepared baking sheet, leaving at least 1 inch between doughnuts. Cover the doughnuts loosely with plastic wrap while the oil heats. 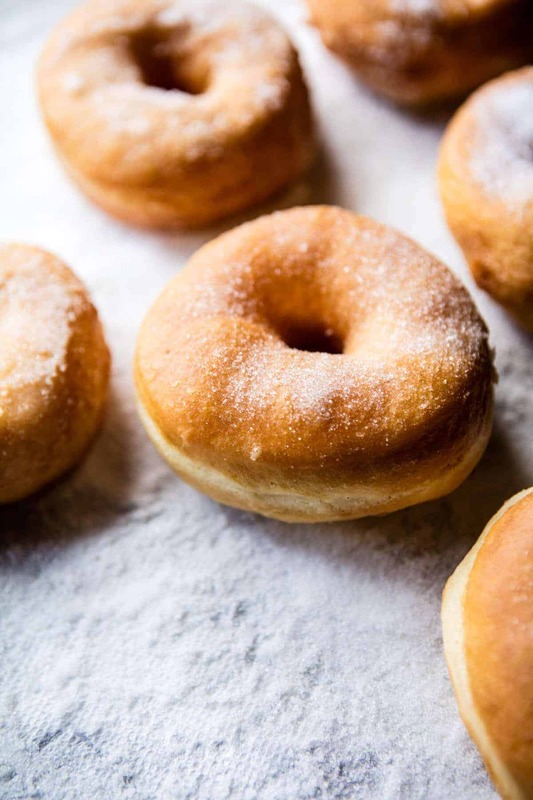 In a heavy-bottomed large pot or deep fryer, heat at least 2 inches of oil until a deep-fry thermometer registers 350 degrees F. Working in batches, use a slotted metal spoon or spatula to carefully place the doughnuts in the hot oil. Fry, flipping once, until light golden brown, 1 to 2 minutes per side. When done, transfer to a wire rack to cool. Make sure to return the oil to 350 degrees F. between batches. Sprinkle each doughnut liberally with sugar and then eat or use as desired! 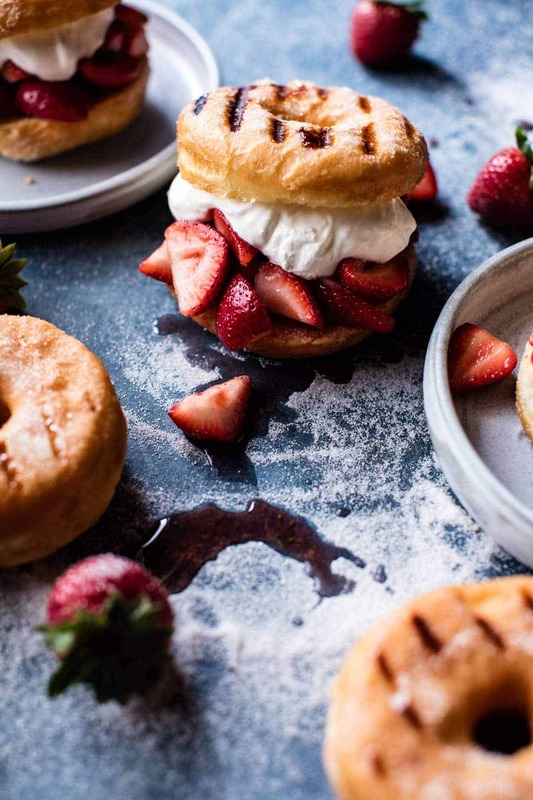 Bring on all the strawberry shortcake grilled doughnuts… please! ? PS. Sorry for all the words in all CAPS today, I’m just way too excited about these shortcake doughnuts! 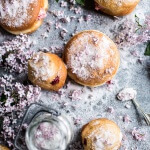 Strawberry Jelly and Vanilla Cream Brioche Doughnuts with Lilac Sugar. Vanilla Cream Filled Cabernet Hot Chocolate Snowball Doughnuts. 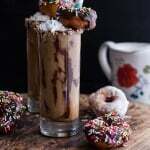 Coconut Iced Coffee…with Mini Chocolate Glazed Coffee Doughnuts. 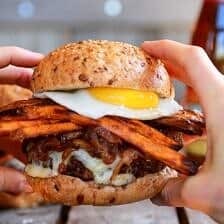 I love how well you photograph all of your recipes! Do you have a background in photography? Well done! I totally agree with Terry! Your recipes are wonderful and yummy, but your photos make them desperately desirable! You really know how to arrange the perfect photo for each dish. Just love them! Woowoo! That means they were a success right!? (: Thanks Miranda! It’s my wife’s dads birthday today and he wants something super unique! This is it! Mind blowing. Happy birthday to him!! Hope he loves it! O gosh, I have never seen these beauties before and now I really need to try this out! Plus.. your pictures are so beautiful! Thank you Arianna! You should try them!! OMG, these look so decadent. I can’t think of a better way to kick off the summer! YESS!! Thank you Karen! Hope you love them! 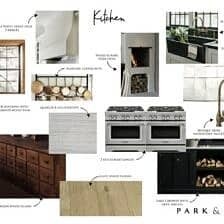 You’d be the perfect person to have a B & B. People would love the menu you would come up with. That could be so so fun! Theres nothing better than watching people enjoy your food! I won’t be able to think about much else today. These are brilliant! Have a great weekend! Thanks Jean! Hope you love them! 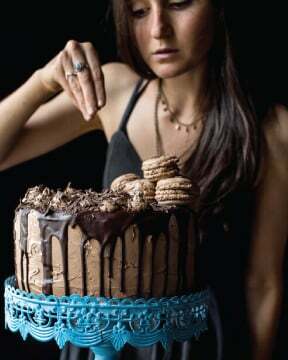 I’m going to make these…and drizzle chocolate sauce on the top. Have your fruit and chocolate too! Oh wow these look amazing and decadent and you photography is just beautiful! Thank you Lili! It means so much! These look wonderful! Love donuts (doughnuts?) and strawberries and carmelized sugar. Awesome that it happened to be on National Donut Day! Will be making some of these as soon as I can! I hope you love them Mandy!! Let me know what you think! Happy National Donut Day! What better time could this stunning recipe have come?! I love the grill marks on each donut! Right! What a holiday!! Thanks Cass! No matter how you spell it (donut or doughnut) these look out of this world. 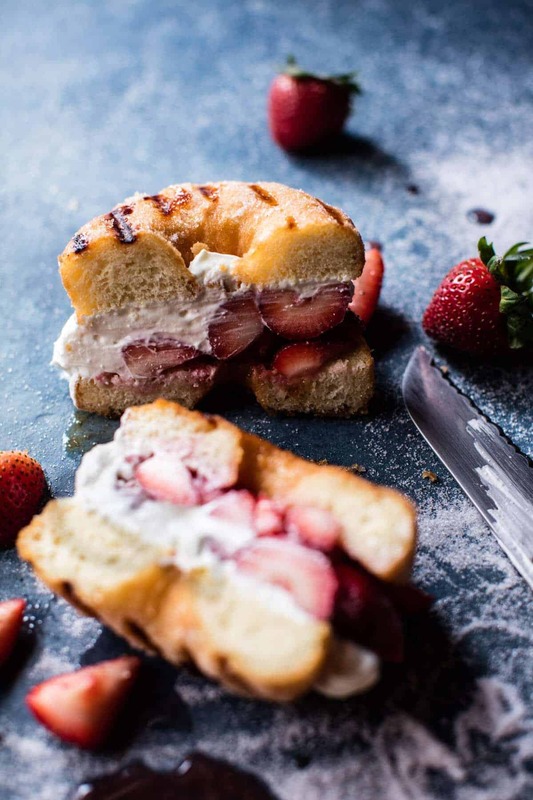 I love the simplistic mix of strawberries and cream in between a decadent homemade donut. #happynationaldonutday ! Gosh, I am salivating here and I am not much into donuts! Beautiful pictures! What a fun way to celebrate National Donut Day. These look delicious! I’ll be heading out your way soon. Please let me know if you care to meet up in Breck or Frisco by emailing me. Thanks Vicki! I’ll shoot you an email! Genius idea Tieghan!! Strawberry shortcake is one of my summer favorites!! 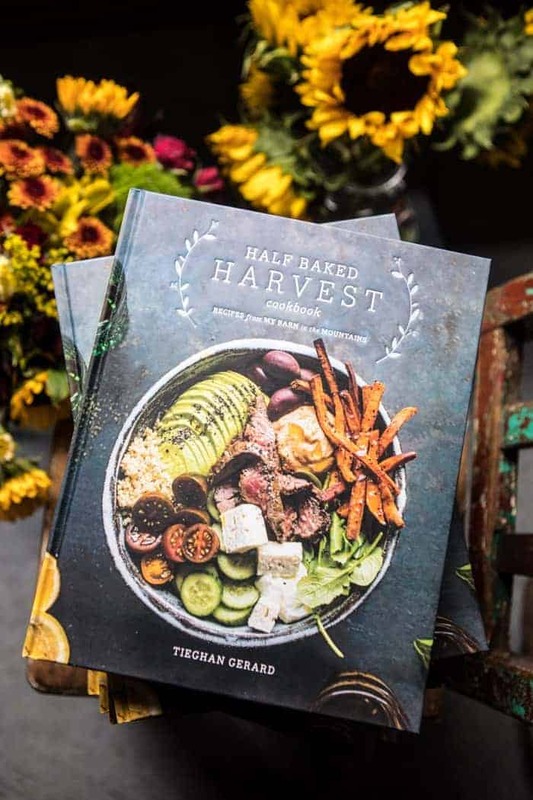 Love that you combined it with a grilled donuts! Looks totally delicious! Thanks Mary Ann! I had to try something new! Luckily it worked! Totally know what you mean about not being a fruit dessert family—that’s how mine is too! But my mom’s apple crumb pie and strawberry shortcake are a couple notable exceptions to the rule. I’m sure donut strawberry shortcake will pass the test too! I hope so! It passed for about half of my family!! Thanks Katie! Let me know how it goes! I can’t stop drooling over these, beautiful shots as always! Thank you Matt, Love hearing from you! Such an original idea! I’m not a doughnut person but you may have converted me. Hehe! So awesome! Hope you love it Caroline! Hi Tieghan, I made these yesterday (and snapped you :-)) – they were sooo good! I just have a question about the size – your recipe says 1,5 inch diameter cookie cutter – I used a 2 and a quarter inch cookie cutter and got 31 donuts (after rerolling the dough). Not a problem at all, I just wondered. Will be making them again soon! Hey Vera! You snap was seriously so awesome, thank you!! So whoa, you got a lot of doughnuts!! I used a larger, regular size doughnut cutter. I must have wrote the wrong size in the directions. Sorry! Head to fix the recipe now. Thanks again! Oh gosh, this is such a genius idea- literally combines two of my favorite desserts! 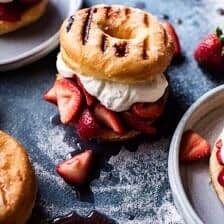 We make donuts a little too often in this house and the next time around I will definitely be grilling them and sandwiching them shortcake style! Thanks for the inspo! Thank you!! I hope you love them Denisse! I totally can’t wait to try this!!!! It doesn’t specify how much honey! Hey Jack, the honey was a typo and I have fixed the recipe. Sorry about that and let me know if you have any other questions, thanks! Absolute perfection, and such a fun spin on strawberry shortcakes! Thanks, Laura! SO happy you like them! What an absolutely fun summer dessert! 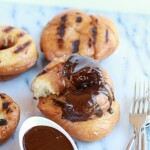 Love love love the grilled donut idea!!! Hi! I just thought I would let you know about these great things I stumbled upon while online shopping; Yoshi grill mats. You may have already heard of them, but they are just so amazing I wanted to make sure you saw them. You put them on your grill and it makes it so your food doesn’t fall through the slots. It’s GREAT for fish and veggies. Plus they’re reusable and my family has totally gotten our money’s worth. oh jeez I sound like an infomercial I swear I was’t sponsored lol, I just remember a while back reading that your dad only likes his fish grilled, so I thought I might let you know about the grill mats. And you still get grill marks! !